Beautifully renovated home in East Point's serene Center Park Neighborhood! Home feat. fresh paint inside & out, Hardieplank siding, new dual pane windows, new roof(25-year warranty)! Beautiful Kitchen with SS & granite open to the Dining & Living Rms. Master Ste offers Lg Bath w/jetted tub, sep shower & huge closet. French doors lead thru Sunrm w/Sep Laundry to lg deck overlooking private, fenced back yard. Walk to EP shopping & dining, weekly Farmer's Market, & the EP Marta station--bus line just 3 blocks away. Super close to airport & easy access to Downtown Atlanta! Driving Directions: I-85 to Langford Pkwy West. Take Exit toward East Point/Ft Mcpherson. Merge onto Womack. Turn Rt on Main St. and stay straight onto church. Turn right on Center and home is on the right. 1825 Center Avenue, East Point, GA 30344 (MLS# 6515631) is a Single Family property with 2 bedrooms and 2 full bathrooms. 1825 Center Avenue is currently listed for $169,900 and was received on March 07, 2019. Want to learn more about 1825 Center Avenue? 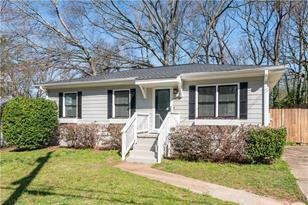 Do you have questions about finding other Single Family real estate for sale in East Point? You can browse all East Point real estate or contact a Coldwell Banker agent to request more information.